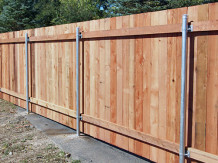 All of our SOLID WOOD fences are made from the highest quality products currently available in the marketplace. 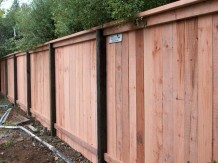 We use only the highest grades of lumber for both the best appearance and longevity of your fence. The following galleries below display the APPEARANCE of our fence styles, there are many different design options when it comes to wood fencing. We take much pride in the quality of our workmanship and material. All posts are set with wet-mix concrete and the boards/rails are secured with rim-shank galvanized nails. 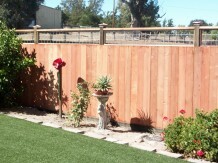 A Flat Top fence can also be called a Square Top fence. This style has the boards butted up against each other with no spaces in-between and cut “flat” at the top. The vertical boards are usually 6″ to 8″ wide, and can be as tall as 8′ high or cut down to be as short as 3′ high. This style is nice way to get full privacy at an affordable price. 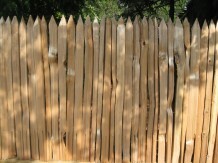 A Dog Ear fence has the top corners the boards cut off at 45 degree angles. This style has the boards butted up against each other with no spaces in between. The vertical boards are usually 6″ to 8″ wide, and can be as tall as 8′ high or cut down to be as short as 3′ high. 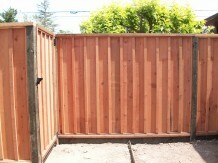 This also is a perfect fence for privacy at an affordable price. 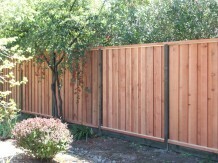 A Good Neighbor fence alternates the front to back of each panel with each section. That way one neighbor doesn’t get the entire rail side, while the other neighbor gets the entire board side. This effect is created by alternating the boards from one side of the rails to the other every 8′. 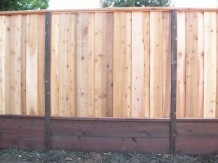 This fence is usually 6′ tall with 6″ to 8″ wide boards. An In-set Picture Frame fence looks the exact same from both sides. This is an alternative style for the Good Neighbor fence. This style only works with a horizontal kickboard. 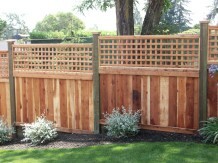 You can add lattice or other toppers to extend the height and beauty of this fence. Shadow Box is a perfect style for the homeowner who wants a custom open look appearance. The boards are nailed to the rails on alternating sides, with a slight overlap. The effect is more privacy when viewed straight on, yet open when viewed at an angle. For a more decorative, finished look we suggest adding a 2″x4″, 2″x6″ or 2″x8″ top cap. 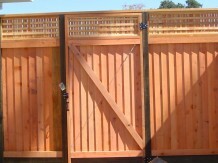 It works well with the following fence styles: flat top, board-on-board, clapboard, shadow box or tongue & groove. A Board-on-Board fence has the boards overlapped. 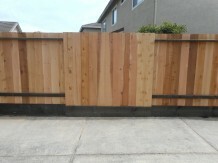 The overlapping of the boards gives more dimension to the fence creating a more architectural effect. You can choose from a 1×6 or 1×8 board and with a 2X6 top cap, this fence takes it a step further and becomes an elegant statement that enhances any property. The Board-on-Board style is one of our favorites! Board and Bat has been around for many years. 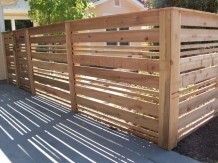 This fence style has one large board (1″x6″ or 1″x8″) overlapping or alternating with one smaller (1″x2″) board. 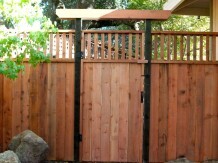 This fence will upgrade your property and give you total privacy. You can change up the pattern and make it your own. 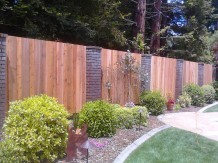 The Clapboard fence has the boards not only overlapping but at an ANGLE. 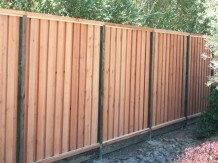 This type of fence has more style that a basic board-on-board. The boards are set vertically or horizontally overlapping each other which gives more depth to the appearance of the boards. This is a perfect style to add a topper to as well. 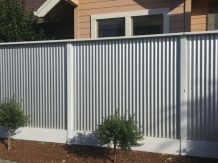 Extend the life of your fence and stand out from all the rest with a galvanized tin fence. This style can be built in many different ways and heights. 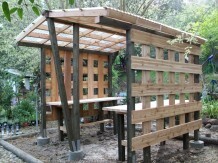 You can also add lattice for a little extra privacy. Tin itself comes in different colors as well so you can change it up and be unique. Instead of placing the boards vertically across each section, the boards are placed horizontally. Many different designs can be created by varying the widths of the horizontal boards, overlapping the boards, or even doing a shadow box style. Horizontal fencing has recently become popular and an innovative alternative to the typical wood fence. The Basket Weave uses horizontal boards woven back and forth on the posts to make an impressive alternative to basic fence enclosures. 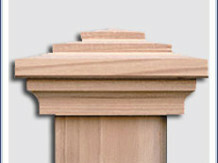 The posts are typically pressure treated Douglas Fir and the horizontal boards are 1″x6″ Construction Heart Redwood. Wood Walls can be quite decorative. 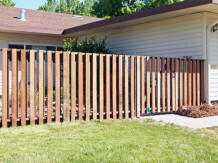 Whether you are screening off your garbage cans, separating off a portion of your yard or creating privacy our walls are a step up from installing a fence. Let us create something different for you – and walls like this are just that! Western Red Cedar palings come 2″ wide, 2 1/2″ wide or 3″ wide (and are all almost 1″thick). The palings are typically butted up to each other and generally used as a more rustic looking backdrop for a country fence. Palings come from the mill in a standard 6′ long, however we can cut them down to any size for your custom project. Grapestakes are heavier than palings, are made out of REDWOOD (not Western Red Cedar) and are roughly 2″x2″ SQUARE in size. Definitely a rustic look just like the Cedar Palings however Grapestakes are thicker, chunkier picket. Lattice comes in 2 styles: Diagonal (creating the diamond shaped opening) OR Square (created the true square-shaped openings). Adding lattice to the top of your fence can create more privacy in a decorative manner. We fully frame in all our lattice to give it a clean finished look. A classy, traditional upgrade to your fence. 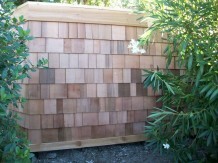 2″ x 2″ pieces of wood are added to the top of your fence and framed in. The spacing between the 2 x 2’s can vary, either creating a more open topper or creating more privacy by having them closer. 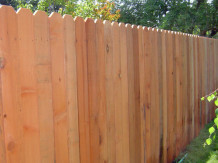 We offer many different types of decorative treatments to add to the top of a solid wood fence. Fence top treatments are an enhancement, giving it added personality to compliment your landscaping. These additions not only add height for more privacy, but can also be used on shorter fences to give a more decorative look. Check out these different top treatments which include: vertical 2X2 or 2X4 toppers, horizontal boards, 2×6 top caps, post caps =….or whatever your imagination can think of. Our customers sometimes want posts that will outlast wood posts. The posts are galvanized round steel posts (typically used for chainlink fences) with brackets that are used to attache the wood rails. Fence styles are usually limited to wood fences without top treatments, so Flat Top, Dog-Ear, Board-on-Board, Clapboard and Capped styles are our general choices for this post type. The advantage of this post comes is recognized when the rails and boards begin to rot and need to be replaced, the posts remain and new rails and boards are installed. So the posts can be reused several times over, saving money in the long run. 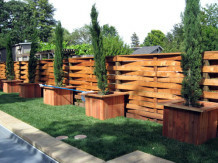 Retaining walls can be used for different purposes: 1) to increase the height of a fence, 2) separate the fence boards from coming into contact with the soil, 3) hold back dirt when there is an elevation issue, and 4)an attractive addition to a fence creating a horizontal counterpoint to the vertical fence boards. The retaining boards are horizontal 2X12 pressure treated Douglas Fir. If you have a design or an idea for a small garden shed we can help you built it. Let us know what you need. We carry a wide variety of postcaps. 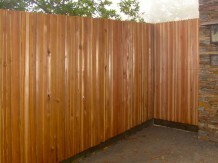 If you would like to order them please visit our Online Store at www.ArborFenceWebstore.com.